It's hard to argue with the success surrounding Journey's eighth studio album. Released in February 1983, the six-times-platinum Frontiers reached No. 2 in the U.S., spawned four Billboard Top 40 singles and became Journey's highest-charting U.K. release. But it still could have been a much better album. Side One is overstuffed with radio-made favorites, including the No. 8 smash "Separate Ways (Worlds Apart)," the No. 12 ballad "Faithfully" and a pair songs that made it to No. 23: "After the Fall" and "Send Her My Love." The record falls off considerably, however, on its second side, and that ended up keeping Frontiers from passing 1981's Escape as Journey's best '80s album. So, what happened? Had Journey, coming off their biggest year ever, simply run out of gas creatively? Were the seeds of future issues that surfaced during the Raised on Radio era already being sown? Actually, the answer as to why Frontiers loses so much momentum so quickly is far more rudimentary: A record-label guy screwed everything up. The song lineup was already confirmed, and Frontiers was set to be pressed, when an A&R rep decided that Journey should pull two songs for use on contemporary soundtracks. "Only the Young" and "Ask the Lonely" were replaced by "Back Talk" and "Troubled Child." Side Two suddenly began to take shape as something distinct from what came before – both on Frontiers and for the band itself. It was edgier, a bit more experimental. 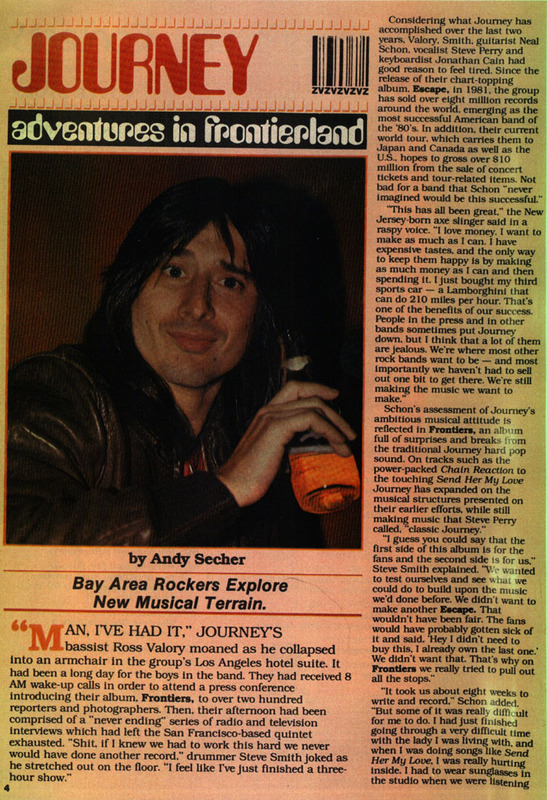 "No one can say that songs like 'Back Talk' or 'Edge of the Blade' are reminiscent of things that appeared on Escape," Steve Perry told Hit Parader in 1983. "We've got to keep challenging ourselves to keep things interesting." The problem wasn't their gumption; it was the relative quality of the replacement songs: "Troubled Child" is the album's worst moment. Meanwhile, "Only the Young" emerged as a bona-fide hit after finally being released in 1985. Now forever linked to a dying boy's final wish, the song would have become the centerpiece of the concluding half of Frontiers. Instead, "Only the Young" languished for years, showing up as a cover on Scandal's 1984 album Warrior before eventually finding a home on the Vision Quest soundtrack in 1985. All of a sudden, Journey had the No. 9 hit that Frontiers always deserved, and only then did the song's remarkable backstory become more widely known. The first person outside of Journey's inner circle to hear the song was Kenny Sykaluk, a 16-year-old Ohio native battling a terminal case of cystic fibrosis. His mother had written Journey in the hopes they could visit Sykaluk, and they made an emotional trip to his bedside in Cleveland. Neal Schon said Sykaluk's attitude in the face of such adversity put everything in perspective for the band, which was already experiencing no small amount of friction. "As soon as I stepped out of that hospital room, I lost it," Perry said in the liner notes to the Time3 box set. "Nurses had to take me to a room by myself." They gave Sykaluk a Walkman cassette player with a copy of "Only the Young" inside, along with other special items. He died the very next day. "Here's this little kid, struggling for every breath. We were doing everything in our power not to break down and bawl in front of him," a tearful Jonathan Cain said during the band's episode of VH1's Behind the Music. "That song will always be his song." Journey ended up opening every concert with "Only the Young" during the Raised on Radio tour, their last with Perry. Frontiers also could have featured "Only Solutions," which instead was lost to the Tron movie. This underrated 1982 song grew out of a studio jam between Cain and Schon, and finds Journey loosening up during a period of intense scrutiny and expectation. ("If it sounds like something we made up on the spot in the studio," Schon said in Time3, "that's because it is.") "Only Solutions" was instead added at the last moment to the Walt Disney movie's closing titles; in fact, it was so late that the song couldn't be included on Tron's official soundtrack. Another prospective track, Cain's "Allies," appeared on Heart's 1983 album Passionworks. "Ask the Lonely," meanwhile, was a patented Perry-Cain mid-tempo number – and maybe that led to the tune's overlooked status. Perry seemingly dismissed it as "just a love song," while Cain marveled at the former Journey singer's ability to "write love songs in his sleep." It certainly would have helped ground Side Two. In the end, however, "Ask the Lonely" got tucked away on the soundtrack to Two of a Kind, a 1983 flop reunion film starring Grease vets John Travolta and Olivia Newton-John. A 2006 expanded reissue of Frontiers attempted to set things right and included a quartet of songs from the same sessions that would have greatly improved the final product: "Only the Young," "Ask the Lonely," "Only Solutions" and "Liberty," a layered, patriotic tune that was also left on the cutting-room floor. By then, Perry was long gone.